Introducing the Original Twist canal going house boat; in the style of a narrow boat only bigger, better and absolutely modern. As a living unit it presents an economical lifestyle choice. For around £160,000 you get very low cost housing and maybe some change left over for a holiday house, long ski breaks and other good things. A comparable land based house or flat would be twice the price because of the cost of land, a boat on the other hand effectively rents the river via the canal licence. A house boat might be small but as well as reduced outgoings there are some great advantages. You are never stuck anywhere you don’t like; if you need a change you can just cruise to somewhere else, maybe near a cosy riverside pub. River life can be like an aquatic pub crawl but without the driving. You’ll make more friends among the friendly and hospitable canal community too, especially with the most interesting boat on the water. There is more scope for travel than just the English waters as you can get a tow across the channel to use the huge French network extending all the way down to the South of France where winters are not so harsh. Otherwise the house boat is an attractive proposition for a house swap so the whole world is your lobster. It’s a tough life being retired! The Original Twist Eco-house boat is all about, modernity, comfort and enough economy to make a modest pension go far. Many traditional ideas have been updated to achieve this. Unlike a go-anywhere narrow boat ours is 10 feet wide and 55 feet long – we’ll forgo visits to a few stretches of narrow canal in exchange for a lot more room and the garage – yes that’s right, a garage. The shell of the boat is normal steel but without the enclosing steel roof parts. The front saloon and the rear transom are full height steel as is the central bulkhead that separates them. The two open parts between the steel constructions are connected at roof level by tubular trellised ladder frames which run the length of the boat interrupted only by the central bulkhead. The open parts of the boat are then covered by 2 insulated wooden rooms made of plywood and foam panels (SIPS).which are factory prefabricated – complete with windows, pipes, wires etc. This makes the boat lighter, cheaper and better insulated. The two central living spaces house the kitchen a bedroom and shower room, all with heated floors. 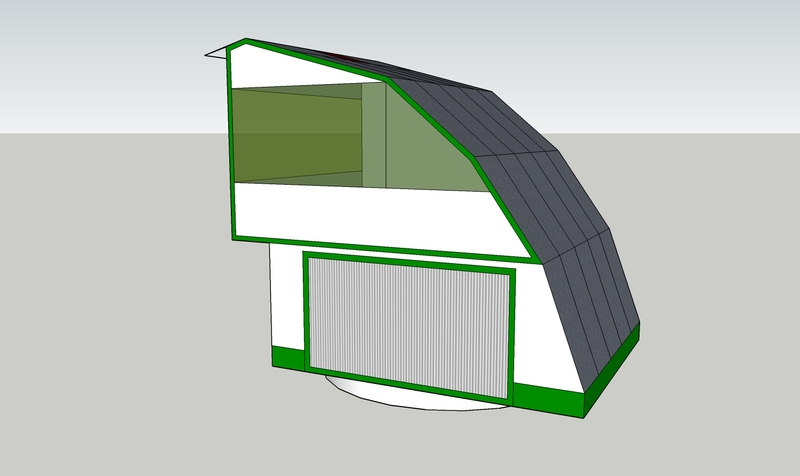 Each has a large pop-up roof (just like on a camper van) to give a more spacious feel while being flattened whenever a low bridge is encountered. These roofs carry the solar panels and can tilt sideways in either direction to catch the sun – the simple mechanism to switch hinge points is activated by the flick of a switch. The steel and glass front saloon is very light and airy with a door giving access to the front deck. Standard fan-coil units are turned on end to make a pair of powerful demisters for the huge windscreen and to heat the room too. A flat sun deck on the roof of the saloon makes a great place to watch the world go by and as we shall see later the boat can be steered from up there too. The steel rear transom accommodates the propeller shaft, engine mounts, rudder mechanism, a niche for the air source heat pump. A tail hoist mounted across the back (like on delivery trucks) supports a light vehicle such as a Polaris RAZR side by side. After adjusting the height the ramps are dropped and locked onto a nearby bank so one can drive off in style and comfort. What is life without wheels? Because the hoist can be folded up, the length of the whole boat can be shortened to navigate some of the tighter locks. 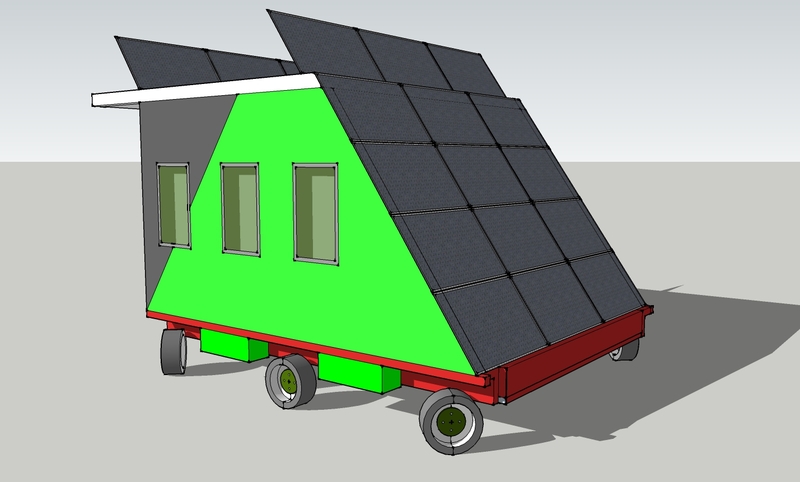 An awning can be extended over the vehicle and there we have it; the first house boat with a garage. The real point about eco-technomologicalness is to get along as cheaply as possible without damaging the planet. The 24 solar panels on the top produce a nominal 6kWp; more than most domestic arrays and enough for the small air source heat pump and to charge the batteries for the electric hybrid drive system. The hybrid drive is almost identical to that on the Original Twist hybrid 3-wheeler found on this site; here with a Lynch motor and a Kohler water cooled diesel. The usual benefits of a hybrid drive are there; the batteries give a few hours silent cruising and the diesel can take over indefinitely. The batteries are mostly solar charged or sometimes diesel engine charged with the Lynch motor doubling as a generator. Many moorings supply electricity so the batteries can be charged on cloudy days. With the air source heat pump the heating will run cheaply and conveniently off connected electricity or the batteries. So there are 4 sources of heating power; the PV panels, wet panels, outside electricity and engine cooling . Most boat engines are cooled by river water but here a second coil in the heat bank uses the 60% of wasted heat to make hot water. There is no connection to the river or the gunk that blocks up the filters (boat owners nod knowingly here). Notable omissions are a wood stove and any gas as there is no need for either. Control of all the lights, heating, entertainment and even the steering is done by i-pad and Z-Wave meshed radio modules which are cheap, reliable and plentiful home automation items. Narrow boats are usually driven from the back, a bit like a bus driver standing on the rear bumper. We can sit at the front in the saloon and steer from there or from anywhere else within range of the wi-fi; perhaps the sun deck even from the nearby pub! The Z-Wave controller allows for plenty of home automation tweaks like lighting control, security and leak detection, all from anywhere in the world. Theoretically the boat can be driven from anywhere there is an internet connection. Actuators to move things like the roof panels and the rudder are operated by compressed air which is cleaner and easier to maintain. An i-pad and Z-Wave relays makes child’s play of these things; even a simple dimmer switch allows proportional control of the rudder. The motorised satellite dish also needs to fold into a recess in the centre section when a bridge is encountered. To make the kitchen a great place for eating while admiring the view the picture window on one side tilts up and out and a table is pushed outwards to make use of the outside space. Once parked up an extending awning over a drop down side deck, complete with an extending Barbie unit, makes an outside cooking area. Central dust extraction – The centre section houses a fixed dust extractor plumbed to outlets around the boat to make cleaning much easier. With a boat like this life will certainly be rich and varied. 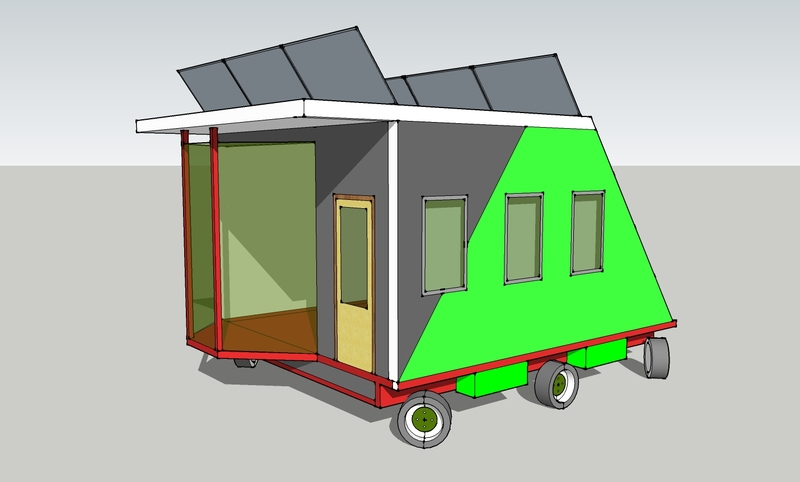 ECO-HIPPY – One who is sufficiently off-grid to live almost cost free. A 270cc engine in a car! Surely we jest? Well first let’s see what the engine is required to do. Remember the car is a light, range extended plug-in electric car with everything minimalised to save weight. Even the electric range is cut back to 25 miles to halve the usual battery pack; half the weight and half the cost. In normal use the car would do the school run or a shopping trip on battery power alone but with no range anxiety thanks to petrol back up. Most electric cars boast longer range but for the majority of journeys they have carried around a heavy stack of surplus batteries. It follows that for most of our short journeys we are also lugging round the petrol engine so weight is going to be a major consideration. The main use for the petrol engine might come from a weekend run in the country with some fast roads thrown in. With the 20-40bhp electric motor for brisk acceleration and overtaking the 12bhp petrol motor is really just for cruising at up to 50mph. Bear in mind that the engine is charging the batteries when the car is stationary, at the lights say, so the available, combined power when on the move is higher than one might imagine. 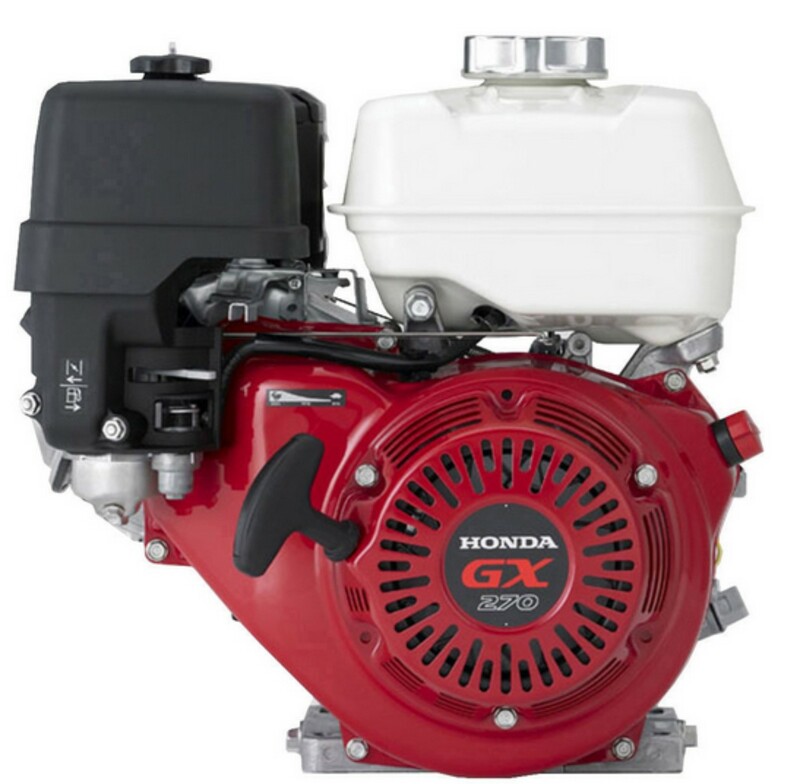 The Honda GX engine range actually gives us the choice to go for a bit more power but with weight penalties. Thanks to the go-kart scene they can all be tuned for more revs and more power. The rev limiter is always removed and a stronger flywheel added. The GX200 only weighs 35lbs and can produce a useful 9bhp. The Loncin Chinese clone version only costs around £250 and makes a good starting point. Next up is the GX270. Weighing in at 55lbs this might turn out to be the sweet spot between power and weight. With the usual modifications and the bigger carburettor from the GX390 this engine will give a good 12bhp. The GX390 is good for up to 20 bhp but weighs a back straining 69lbs. Only testing will tell if that is departing too much from the light and minimalist idea but it would certainly be good for breaking the speed limit on the motorway. 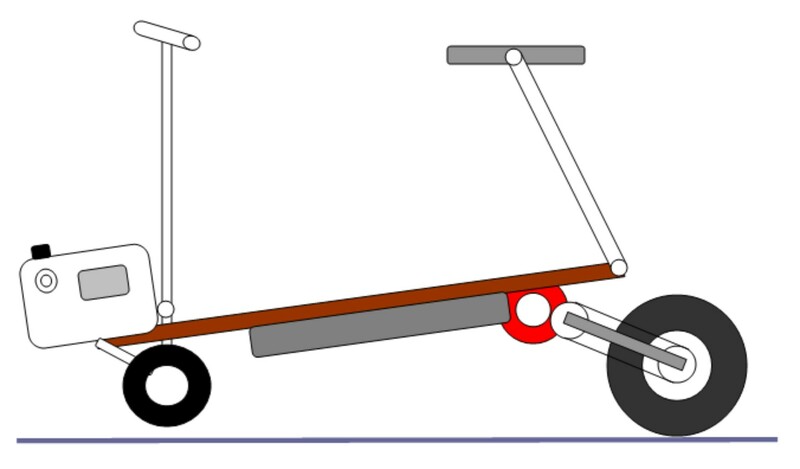 One should bear in mind that the engine and the electric motor are mounted just ahead of the rear wheel and the aim is to keep the overall weight distribution just slightly front heavy. 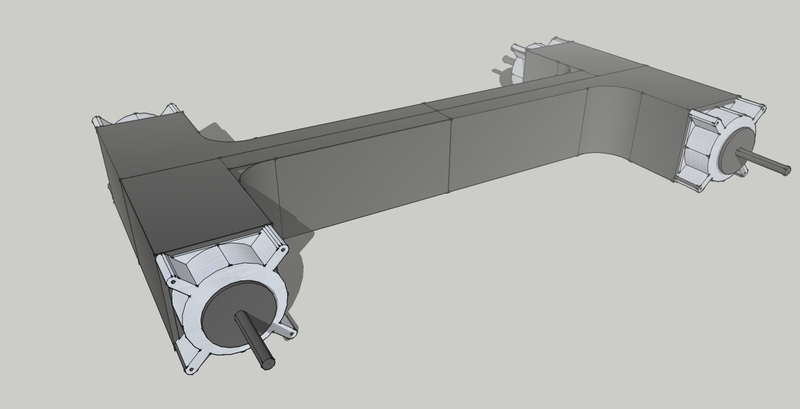 The engine mounting plate on the Original Twist hybrid 3-wheeler will be pre-drilled to mount all 3 engines so the choice is there. We can also consider the Briggs and Stratton racing engine with all the right bits built in at the factory – it’s called the ‘Animal’. No doubt some inveterate tinkerers will have a spare engine for tuning experiments and, who knows, in time there might even be a racing series. It is the intention that the engine will be pretty much clipped on and able to be changed in a couple of minutes so concepts like service exchange engines, rented engines etc are feasible. With that in mind the little 35lb GX200 that fits in a shopping bag looks attractive.